Leaders from European and Arab nations met in Egypt to talk about a promising new mechanism for cooperation on key issues in the region. Despite being castigated as the bad boys in causing environmental damage, a new study shows China and India are actually leading the way in creating a greener world. Speaking at the Munich Security Conference of 2019, Chinese Politbureau member Yang Jiechi underscored Beijing’s collaborative role in a foreign policy based on mutual respect, multilateralism and a shared future. The postwar alliance between Western Europe and the U.S. is rapidly unraveling, increasing global political uncertainty and providing fuel for many conflicts around the globe. 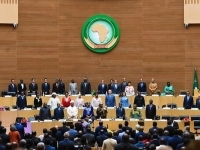 The newly elected AU Chairperson Abdel Fattah el-Sisi will focus on peace and security on the African continent. However, more funding and support is needed to carry out this task. Donald Trump's decision to scrap the INF Treaty with Russia is understandable in some ways, but there remains a definite need to find a better replacement. The agreement between France and Germany on greater bilateral cooperation is designed to further promote European peace and stability; yet, by seeking to isolate the U.S. and the U.K., it might create the opposite effect. The accord between Greece and North Macedonia, over a longstanding name dispute, is an encouraging development in the often-tortuous Balkan politics. The British people voted to leave the European Union. Now, they find themselves in unchartered waters, having to pay for a decision based more on emotion than thoughtful calculation.